1/ Wildcat starts with a wide range of precursor materials that may have potential for energy storage and other applications. 2/ Here, some precursor materials have been refined into powder suitable for making battery electrodes. 3/ Cathodes, anodes, and electrolytes are assembled into small working batteries, which are tested by the thousand in this tower. Testing materials together allows dud combinations to be eliminated quickly. 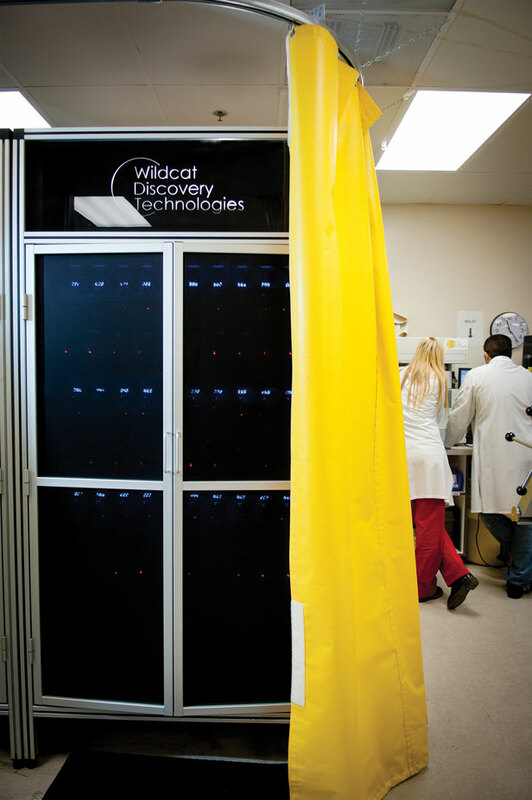 To hunt down winning combinations, Wildcat has adopted a strategy originally developed by drug discovery labs: high-throughput combinatorial chemistry. Instead of testing one material at a time, Wildcat methodically runs through thousands of tests in parallel, synthesizing and testing some 3,000 new material combinations a week. “We’ve got materials in the pipeline that could triple energy density,” says CEO Mark Gresser. Others have tried the combinatorial technique to find new battery materials, but they’ve run into a stumbling block. 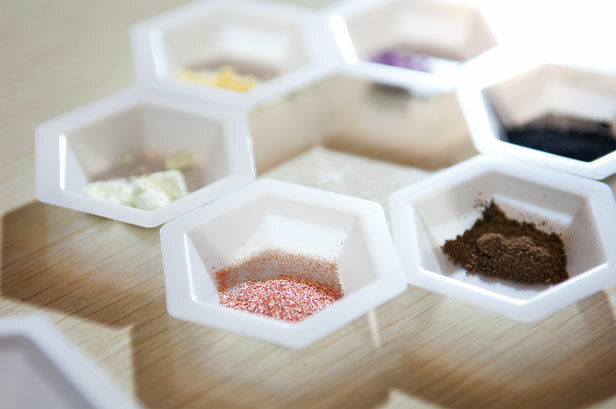 The easy way to test thousands of materials is to deposit a sample of each one in a thin film atop a substrate. 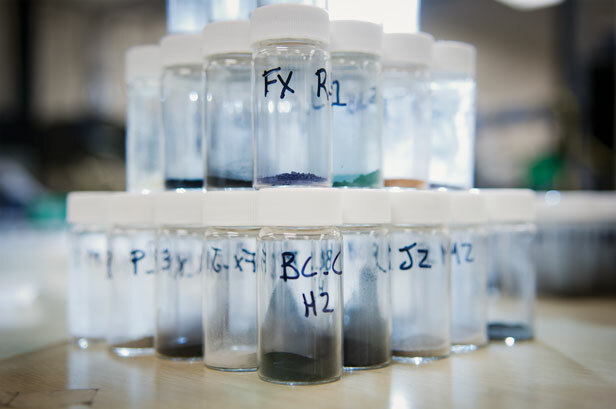 This approach did allow previous researchers to turn up promising materials for battery components—but then candidates would typically prove unsuited to cost-effective large-scale production processes. 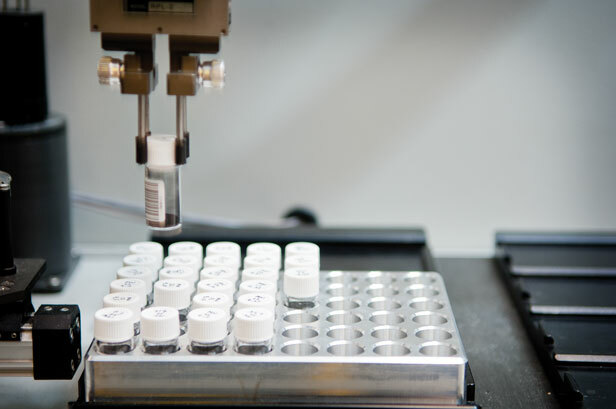 To process so many samples, Wildcat relies heavily on automation. This assay machine weighs and records vials of materials. To avoid that time-wasting detour, Wildcat found ways to produce samples using miniaturized versions of large-scale production techniques. In effect, the candidate materials are being tested for ease of manufacturing at the same time as they’re being tested for performance. Wildcat also tests the materials wired together as actual batteries, and in a variety of potential operating conditions. “There are a lot of variables that affect battery performance, including temperature and voltage, and we examine all of them,” says Gresser. The result is that a material that performs well in a Wildcat test bed will probably perform well in field tests. with car batteries (lead acid) hydrogen offgassing was such a problem that most car batteries are designed to slow it down and get reduced efficiency because of it- no one that I've seen has tried to take advantage of it with recent fuel cell technological advances. Off grid alternative energy installations often have to desulphate batteries to extend their life. Its another of those material capabilities that I haven't seen explored with battery designs. Similar to popping an almost dead laptop battery in the freezer for an hour- though I think I read it doesn't work for Lithium ion batteries. ufo reports speak often of 'crystals' used as power supplies- I'd be thinking that maybe the reports revealed some (non-cognitive maybe?) ionic crystal structure (irregardless of the 'source' of the info( ufo reports-lol...). mayhaps a buchy ball is not all its supposed to be (benzene snakes, or electro magnetic hysteresis, etc being a dream in the first place). could would should is great, but we live in the now! If they are successful is not a fact its a hope in something that has not yet taken place. I am tired of reading about what could happen, report on facts please, break throughs that is, find the guy in his garage that has already invented the next gen battery and feature the little guy for once, not the companies and colleges looking for more funding.